Standing tall at 4,566 m, Mount Meru is the fifth highest peak on the African continent and the second highest in Tanzania. About 250,000 years ago, a massive volcanic eruption blew the entire eastern flank of the mountain and left it with the distinctive appearance it has today. The route for the ascent of Mount Meru goes through several vegetation zones. The dry forest of the lower region gives way to a dense mountain forest, which then gives way to a scrubland. Towards the top of the mountain, the vegetation consists of moors and is finally filled with beautiful barren alpine deserts. During the ascent, you will regularly encounter big game like elephants and buffaloes and possibly leopards. 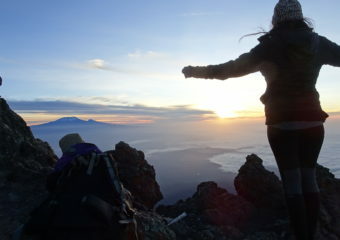 Mount Meru climbers enjoy a beautiful view and varied landscapes which will accompany your hike. 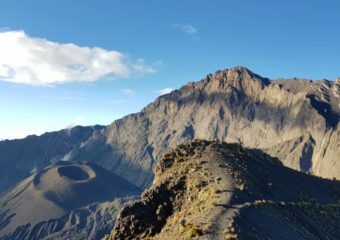 Explore mount Meru, one of Tanzania’s and Africa’s wonders. During your climb, you will enjoy the view of the landscape and animals of the Arusha National Park. In the morning, you will be brought from your hotel to the entrance of Arusha National Park, then you will leave at the entrance of Momella. Explore mount Meru, one of Tanzania’s and Africa’s wonders. During your climb, you will enjoy the view of the landscape and animals of the Arusha National Park. Arusha – Momella Gate (1500m) – Miriakamba Hut (2500m) In the morning you will be brought from your hotel to the entrance to the Arusha National Park, then you will leave at the entrance of Momella.